Heritage Projects are, by their very nature, unique. In the last year alone, tax accountancy Chiene + Tait has advised on a variety of projects including the restoration of a railway goods shed, a Victorian gasworks, an orangery building and a medieval public house. All of these projects were exceptional in their own way, but all were primarily concerned with bringing back to life beautiful, cultural and historic buildings to ensure future generations can benefit from them. And each of them was able to benefit from early and careful consideration of its VAT position. In projects of this nature VAT is one of those issues that needs to be considered at an early stage. In particular: will VAT be charged on the renovation works and at what rate, and if VAT is charged, can this be recovered? Unfortunately, the answer to the first question is simple: yes, and usually at 20 per cent. Until 2012, approved renovations to listed buildings used for residential and charitable purposes qualified for zero-rating VAT which greatly helped reduce the VAT costs on projects and increased their viability, particularly those projects where conservation work predominated. This zero-rating provision is no longer available. A five per cent reduced VAT is available in a limited number of instances which may assist in mitigating VAT costs for certain conservation projects, as outlined below. These apply irrespective of whether the building is listed or not, however the standard 20 per cent VAT rate will apply to works and professional fees in most projects. The lack of VAT concessions for heritage property means that there is often only one viable option to reduce the VAT cost on capital works and ongoing costs and that is to consider registering for VAT. This brings with it increased administration, and it can also impact on the nature of the activities that take place within the renovated building. townhouse being converted into a number of apartments. The reduced rate covers construction work and building materials. Any professional fees will still be subject to VAT at 20 per cent. VAT registration gives trusts the opportunity to recover VAT. This is not as simple as it sounds, and the benefits of VAT registration and VAT recovery must be considered along with the additional administration burden of submitting VAT returns and calculating the trust’s VAT recovery position throughout the project and going forward. The process and its outcomes will depend on the extent to which the trust makes taxable supplies in the building. Assuming the trust operates the property, this would mean opting to tax the property, charging VAT on rents and licences, or trading from the property via a shop, café or other retail facility. free-of-charge activities that take place in the building. For example, granting free-of-charge access to the general public is regarded as a non-business activity which can limit the trust’s ability to recover VAT. If the building has a mix of commercial activities (leases and licences, retail, café) and free-of-charge access, it is likely that there will be a partial restriction in the amount of VAT that would be available for recovery on the capital costs (and ongoing costs too). Often these questions arise at the grant application stage. Grant-giving bodies often ask about a trust’s VAT recovery position, and grant applications may carry a requirement for the trust to detail the position before the grant can be given. This is usually a good stage to speak to a VAT adviser. The implications for getting it wrong can be severe, and it will give the trust early foresight of any financial shortfalls which would need to be met by other funding sources. proof of title to the property or leasehold interest. If this information is available it should be sent to HMRC within 30 days of the rejection notice. HMRC will generally accept the VAT registration application at this stage if it is satisfied that taxable income will be received in the future. It goes without saying, if your trust is planning a major capital property project, VAT advice should be obtained at an early stage. This is often a requirement of Heritage Lottery and other grant funding applications. An initial review of a project could confirm with reasonable accuracy the answer to the questions posed above. After that, the trust can continue with your project knowing that its financial projections are accurate and that the VAT cost is known. A trust registers for VAT and undertakes the types of activities normally associated with commercial organisations, such as charging rents and licences, retail and catering. 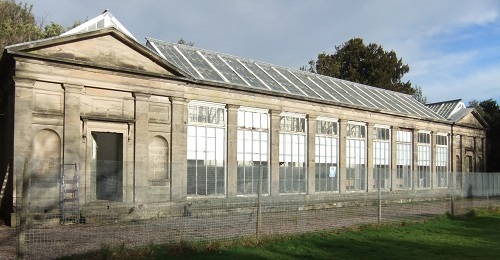 In some cases, this has been part of the trust’s business plan all along to ensure the building is self-sufficient after Heritage Lottery Funding and other donations for the initial capital phase are used up. One consequence of this model is that opting to tax the property will be necessary in order to maximise VAT recovery. This means that VAT would apply to rents and licences. In areas where margins are tight the addition of a 20 per cent charge can be a cause for concern, but many trusts have adopted a tapered pricing structure which offers discounted rental prices for community groups and charities, with higher commercial rates for businesses, weddings, conferences and the like. This way, VAT is still charged but there is less of a burden on the local community. 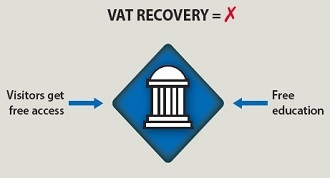 VAT recovery can be maximised right from the start of the project. 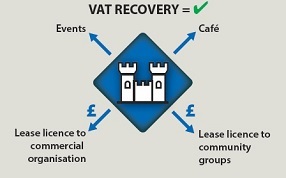 If a trust allows free-of-charge access to events and exhibits, this can create a VAT recovery problem. The provision of such a facility is not completely fatal to VAT recovery on a project, but if this is all that is planned for in the property it’s likely that VAT registration will not be possible as no taxable supplies will be made. VAT recovery is likely to be minimal or not available. The most common type of model blends a mix of income generating leases and licences and free-of-charge heritage or educational activities. Where this takes place, some sort of restriction in VAT recovery would be required – potentially based on floor-space or visitor numbers or another fair and reasonable criteria. The trust should be able to obtain some VAT recovery provided VAT is charged on the commercial activities. 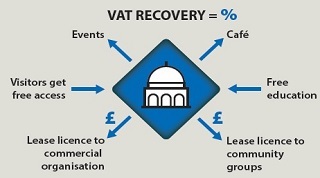 With this model, the heritage property may have a small shop or some retail or café income, so VAT recovery can still be significant even if there are some free-of-charge non-business activities taking place. We recommend that trusts adopting this type of model seek advice from a VAT expert. HMRC will scrutinise the basis for the VAT recovery at some point so coming up with an accurate percentage at an early stage will prevent any surprises in the future, and an expert can help the trust get it right. Recent European Court and UK VAT cases have suggested that such restrictions may not have to be as severe as previously thought, particularly where it can be argued that this non-business activity can be seen to boost other commercial activity such as a shop or a café. We await further guidance from HMRC on its latest position, but this development could certainly assist heritage trusts in the future.